MinXSS-1 burned up in the earth’s atmosphere this weekend. 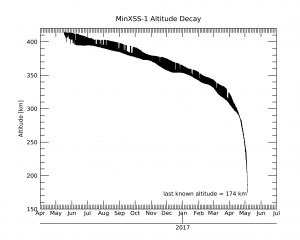 After a week of rapid altitude decay due to exponentially increasing atmospheric drag at lower altitudes (see plot below), MinXSS-1 finally deorbited. The last contact from the spacecraft came from an Australian HAM operator, VK2FAK, at 2017-05-06 02:37:26 UTC. The data have been decoded and are shown below (ignore the timestamp). Of particular note is that temperatures at that time were very high. The -Y deployable solar panel was actually showing a value that indicates it was completely disconnected, in other words, the solar panel had already ripped off! This means that this broadcast beacon was likely only seconds or minutes before the entire spacecraft disintegrated. If you look closely however, you’ll see that the batteries were still close to room temperature. This is due to the thermal design, which sought to isolate the batteries from the rest of the system. It proved to be a lot more effective than we’d imagined! The last 2 days of the mission were spent in Phoenix mode — a spacecraft mode designed to minimize power consumption and just charge the battery. Even the pointing knowledge and control system is powered off in this state, so the spacecraft is tumbling. 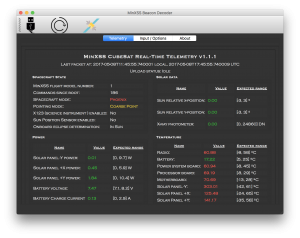 Thanks to the omni-directional antenna, we were still able to receive beacons from MinXSS despite the tumbling. A few hours before Phoenix mode, the spacecraft was no longer able to dump momentum into the earth’s magnetosphere as quickly as it was built up from atmospheric drag. As such, it was no longer able to keep itself pointed at the sun. At this point, the spacecraft was already << 200 km altitude, a time when no one thought the spacecraft would work at all anymore. In fact, we were still doing special tests with the spacecraft just hours before it burned up. The last passes over the command center at LASP in Boulder were 11.5 hours and 10 hours prior to burn up. During those passes, special tests were done to test how the pointing system performed. The system performed admirably until the end. Science data continued to be collected up until just 2 days prior to the sudden deorbit. MinXSS-1 was originally proposed to record 3 months of science observations on orbit. The final run time in space came to 11 months, 19 days, 16 hours, 32 minutes, most of which was in science mode.